A nuclear test is carried out on an island in French Polynesia in 1971. Every effort should be made to bring a global treaty into force that prevents more countries from developing nuclear weapons, UN Secretary-General António Guterres has said. His appeal came in a message for the International Day Against Nuclear Tests, observed annually on 29 August. 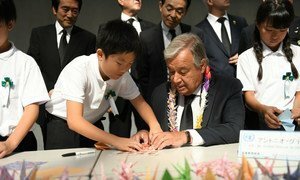 “The history of nuclear testing is one of suffering, with the victims of more than 2,000 nuclear tests often from the most vulnerable communities around of the world,” Mr. Guterres said. The UN has been pressing for the Comprehensive Nuclear-Test-Ban-Treaty (CTBT) to become law. The treaty prohibits nuclear explosions anywhere – whether on the Earth’s surface, in the atmosphere, underwater or underground. It also makes it difficult for countries to develop nuclear bombs for the first time, and prevents nations that already possess nuclear technology from developing even more powerful bombs. More than 180 countries have signed the treaty, most of whom have also ratified it. However, while nearly universal, the treaty will only enter into force after it is signed and ratified by eight countries with nuclear technology capacity: China, Egypt, India, Iran, Israel, North Korea, Pakistan and the United States. Lassina Zerbo, Executive Secretary of the UN commission which promotes the treaty, known as the CTBTO, also called on the international community to “take the final steps” to ensure its entry into force. “As long as the Treaty is not in force, the established international norm against nuclear testing and the global verification system that has been developed over the past two decades are at risk. I urge the last eight countries to ratify the Treaty and I appeal to others to renew their efforts in supporting it,” he said, also in a message to mark the International Day. Mr. Zerbo said his conviction regarding the role the treaty can play on the Korean Peninsula was strengthened following a visit to the region last week. The CTBTO is hosting a meeting in Kazakhstan this week, which brings together international experts and young people to look at key issues surrounding denuclearization. “For Kazakhstan, it was very important to share its own experience in having the nuclear tests conducted in its territory,” said Ambassador Kairat Umarov, the Permanent Representative of Kazakhstan to the UN, emphasizing that nuclear weapons are not only destructive when they are used, but also that their harmful effects continue to linger on, devastating people’s lives and the environment where they are used. “If we talk in figures, the after effects of the nuclear tests in the air, on the ground and under the ground, it is like spraying 300 kilograms of weapons-grade plutonium over 18,000 square kilometers […] a huge territory that is rendered useless,” he explained.